Okara — the residue from the production of soy milk and tofu — has an unpleasant smell and taste. About 10,000 tonnes of this pulp is produced in Singapore each year. Usually it is discarded by soy food producers as food waste. Now, scientist at the National University of Singapore have devised a process that could allow to use it as nutrient source. Singapore — Food scientists at the National University of Singapore (NUS) have given okara a new lease of life by turning it into a refreshing drink that contains live probiotics, dietary fibre, free isoflavones and amino acids. By encapsulating these nutrients in a beverage, they can be easily absorbed into the body, and promote gut health. Created using a patented zero-waste process, the tasty drink can be stored at room temperature for up to six weeks and still retain high counts of live probiotics to better deliver health effects. This is unlike commercially available probiotic drinks which are mainly dairy-based and require refrigeration to maintain their levels of live probiotics. These beverages also have an average shelf-life of four weeks, and do not contain free isoflavones, which have a host of health benefits. The team's breakthrough lies in their unique combination of enzymes, probiotics and yeast that work together to make okara less gritty, and give it a fruity aroma while keeping the probiotics alive. 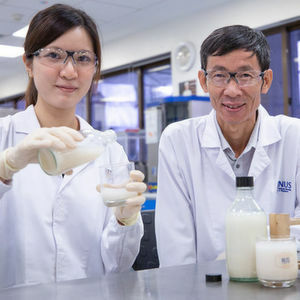 The final product offers a nutritious, non-dairy alternative that is eco-friendly, said project supervisor Associate Professor Liu Shao Quan, who is from the Food Science and Technology Programme at the NUS Faculty of Science. 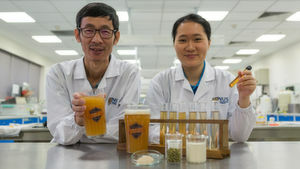 The idea of using fermentation to produce a drink from okara was first conceived by Ms Vong Weng Chan, a PhD student from the NUS Food Science and Technology Programme. During her undergraduate studies at NUS, she worked on a project to examine how soy milk can be infused into different food items, and she realized that a huge amount of okara was being discarded. It occurred to her that fermentation could be one good way to convert unwanted okara into something that is nutritious and tastes good. Under the guidance of Assoc. Prof. Liu, Ms Vong took a year to devise a novel recipe that converts okara into a beverage that is fruity and refreshing. She experimented with 10 different yeasts and four different enzymes before coming up with an ideal combination. The final recipe uses the probiotic strain Lactobacillus paracasei L26, the Viscozyme L enzyme and the Lindnera saturnus NCYC 22 yeast to convert the okara into a nutritious drink that achieves a minimum of 1 billion probiotics per serving, which is the current recommendation by the International Scientific Association for Probiotics and Prebiotics to achieve maximum health benefits. The drink, which takes about one and a half days to produce, also contains free isoflavones, which are naturally occurring antioxidants that maintain cardiovascular health, as well as dietary fibre and amino acids. According to Liu, in recent years, the food and beverage industry has been intensifying efforts to develop products that appeal to consumers who are increasingly health conscious. The new product offered soy food manufacturers a viable solution to reduce waste, and also enabled them to provide a healthy and eco-friendly beverage for their customers, he concludes.